Apart from experimental procedures, each animal used in research and testing experiences many other events during their lifetime, some of which may be painful, distressing, or may influence the animal's ability to cope with regulated procedures. These include transport, marking for identification, capture, handling, restraint, laboratory housing and husbandry, scientific procedures and the after effects of these, and humane killing. Multiple events and stressors like those listed above can affect overall severity, and it is important to consider how their effects may interact with one another. The term 'cumulative severity' is often used, but harms do not 'accumulate', or simply add up - although animals may become sensitised to certain procedures (e.g. repeated injections for a mouse), so the suffering associated with each one is increased. As another example, if recovery time is not sufficient following stressful events, such as cage change, before conducting a procedure, then the severity of the procedure may be elevated. The cumulative impact of some procedures (e.g. surgery without the most effective perioperative analgesia regime) may be long-lasting or permanent. Alternatively, animals may habituate (become used) to repeated procedures, which can reduce suffering, especially if they can be trained using positive reinforcement techniques to avoid restraint. It is critically important not to make subjective assumptions about cumulative severity either increasing or decreasing - expert input and monitoring systems are both necessary to ensure that welfare issues, and refinements, are detected. These are closely linked and can be used to continually inform and update one another, as shown here. The best time to review and consider the lifetime experiences of each animal is at the project planning stage, with input from people with different expertise including the researcher, the veterinarian and animal technologists. The AWERB, AWB or ACUC should be able to provide useful input. A major aim is to identify as many sources of suffering (harms) as possible, so that appropriate refinements can be researched and included in experimental protocols and within housing, husbandry and care, wherever this is compatible with the science. Another important aim when reviewing the animal's lifetime experience is to identify and define humane endpoints. Considering lifetime experiences at the project planning stage can help to determine indicators of suffering that are tailored to the species, strain (if appropriate) and procedure and can be used to assess welfare day to day throughout the procedure. If there are good welfare assessment systems in place for recognising and assessing behavioural and physiological indicators of pain or distress, suffering can be acted upon sooner and more effectively - which will reduce severity. 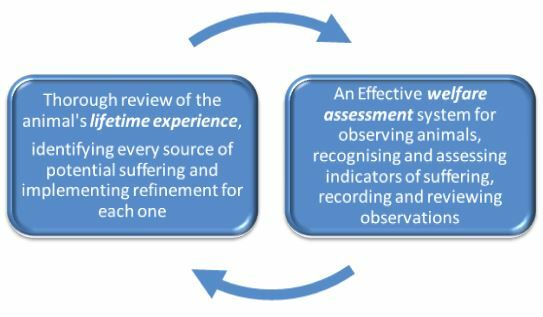 The 'six level category' approach in Appendix 1 of the EC Severity Assessment Working Document (717KB) is helpful when defining an assessment system. Standardised terminology with respect to welfare indicators can also be useful in order to ensure that all staff are 'on the same page' (for example: www.mousewelfareterms.org) and to avoid confusion that could delay intervention. During and after procedures, records of 'cageside' observations can be reviewed to assess how accurately harms were predicted, how severely animals were affected and how effective any refinements have been. All of this information, obtained using robust welfare assessment protocols, should then complete the circle and help to implement refinement in future projects. The regulator within the European Union also requires that 'actual severity' is reported, but this is just a snapshot of the animal's 'worst day' and should only form part of the overall assessment of the animal's experience.